Mini Modern: Many Ask -- Where do you get the figures? 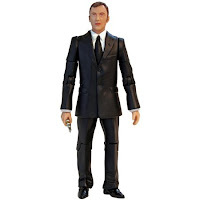 Many Ask -- Where do you get the figures? I am a huge fan of action figure toys. 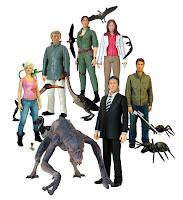 The figures I use in my dollhouses all come from the Dr. Who, Sarah Jane Adventures, Primeval and (soon to be) Torchwood 5” action figures distributed by Character Options of the U.K. 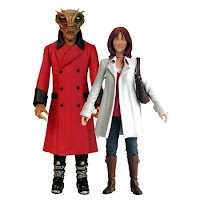 These figures have excellent poseability and are dressed in modern clothing. 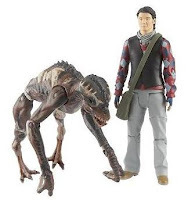 I usually buy them from U.K sites like Forbidden Planet International because the series take too long to be distributed here in the U.S. You can also find them on… (wait for it)…eBay! Remember that vent about modern dollhouse dolls? 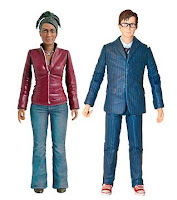 Well, I forgot to mention that I have a fondness for modern cloth miniature dolls made by Erna Meyer (aka Bodo Hennig) and Barbara Graff (Kith & Kin). Overall, I prefer action figures in my miniature scenes, but there’s something about the character in the faces of Meyer's and Graff's art that appeal to me. about to link your DW dinner-party :) ive done a couple of 1 frame DW funnies too! Thank you! I am glad people appreciate the silliness.